Nature magazine recently ran a “point-counterpoint” entitled “Does evolutionary theory need a rethink?”  Arguing for the “Yes, urgently” side were Kevin Laland, Tobias Uller, Marc Feldman, Kim Sterelny, Gerd B. Müller, Armin Moczek, Eva Jablonka, and John Odling-Smee. Arguing for the “No, all is well” thesis were Gregory A. Wray, Hopi E. Hoekstra, Douglas J. Futuyma, Richard E. Lenski, Trudy F. C. Mackay, Dolph Schluter, and Joan E. Strassmann. That’s a good number of top notch evolutionary biologists, colleagues that I very much respect, on both sides of the aisle. My own allegiances have been made clear in a number of papers  and a co-edited book . I have been arguing for some time now for what I consider the moderate-yes side of the debate: yes, evolutionary theory does need (and is, in fact, getting) an update, but that update is yet another expansion along the same trajectory that has moved us from the original Darwinism to the so-called neo-Darwinism to the Modern Synthesis to the (ongoing) Extended Synthesis (more on all of these in a moment). This expansion has nothing to do with hyped claims of rejection of the Darwinian tenet of natural selection, resurgence of Lamarckism, and so forth. (Cue immediate snarky commentary by the Discovery Institute.) Indeed, I have chastised more than once some of my more, shall we say, enthusiastic, colleagues (including, among the above listed authors, Eva Jablonka) for unwittingly creating a backlash among “conservatives” by talking about Lamarck and the death of Darwinism. Why, then, am I writing this essay? Because my friend Sean Carroll (the cosmologist, not the evolutionary developmental biologist) commented on the Nature articles, and took the wrong side! I was surprised, because Sean is usually fair and open minded, and rarely comments on fields that are so far from his own. I must admit I was also slightly piqued by the fact that it didn’t occur to him to check with me before publishing his essay (it’s not hubris, it’s just that I often check with him whenever I write something about quantum mechanics or cosmology, because you know, they ain’t my field). Be that as it may, let me start with what Sean gets wrong, then zoom out to explore the broader picture so that the controversy can be seen in its proper context. I must admit (and I’m certainly biased) that this hardly sounds like ad hominem. It is a reasonable, if unwelcome, analysis of the sociology and psychology underlying the debate. It is definitely the case that evolutionary biologists are worried by the specter of ID. I’m not so sure about the bit concerning funding, though with current levels of NSF approval of research grants as low as 6% that’s not entirely out of the question either. It all began , as it is well known, in 1858, when Charles Darwin and Alfred Russel Wallace presented a joint paper on evolution and natural selection at a meeting of the Linnean Society . The paper was swiftly followed by Darwin’s publication, the following year, of On The Origin of Species, a bestseller that quickly eclipsed Wallace’s own contribution. The twin foundational concepts underlying the Darwinian theory are common descent and natural selection. The idea is that all living organisms are related to each other, and that the major (though, crucially, even then, not the only) mechanism that explains their diversification through time is natural selection. Moreover, natural selection is the mechanism responsible for adaptation, i.e., the functional match between organismal characteristics and the environments in which the relevant organisms live. We then come to the Modern Synthesis (MS), the next improvement over the original version of evolutionary theory. The MS is actually divided into two major phases, one roughly extending from 1918 to the early 1930s, the other taking place from the late ‘30s through the early ‘50s. To simplify quite a bit, by the turn of the 20th century the neo-Darwinian theory was in trouble, so much so that historians of science refer to that period as “Darwin’s eclipse” . The problem — ironically — was partly created by the rediscovery of Mendel’s work, which initially was interpreted not as the much sought after theory of heredity necessary to complement Darwin’s insights, but rather as a threat to the edifice of evolutionary theory. That’s because Darwin had insisted that evolutionary change is always gradual (despite warnings to the contrary by his friend and champion, Thomas H. Huxley), while “Mendelism” seemed to show that the genetic material is inherited as a number of discrete units (the genes, whose chemical basis was, of course, still unknown). Moreover, the early geneticists had begun working on mutations, especially in the fruit fly, which seemed to bring more trouble for Darwin, since all known mutations appeared to produce radical changes in the phenotype (the appearance or behavior of organisms), again contradicting the idea of gradualism. The combination of Mendelism and mutationism, together with the resistance to Darwinian ideas by paleontologists (who saw long term trends in the fossil record, which were thought to be independent of the vagaries of environmental change), produced the widespread feeling that scientists were on the verge of dealing a death blow to neo-Darwinism. A small group of brilliant mathematical biologists came to the rescue, chiefly Ronald Fisher, followed by J.B.S. Haldane and Sewall Wright. Fisher was almost single-handedly responsible for the reconciliation (i.e., the “synthesis”) between Mendelism, Mutationism and (neo)Darwinism: he showed how, assuming (as it turned out to be the case) that phenotypic characteristics are influenced by a relatively large number of genes, the statistical effects of those genes (and their interactions with the environment) creates precisely the sort of continuous distribution of characteristics that Darwin thought would allow natural selection to work. Indeed, Fisher formalized the Darwinian insight in mathematical form, arriving at what still today is a cardinal idea in population genetics, his Fundamental Theorem of Natural Selection . What did the MS-phase 2 consist of? Of the application of the new principles of statistical genetics, cast in a neo-Darwinian fashion, to population genetics (Dobzhansky), natural history (Mayr), paleontology (Simpson), and botany (Stebbins). It was a synthesis in the sense (different from MS-1) that it broadened the scope of what could by then fairly be called the Darwin-Fisher theory of evolution to a good number of (but, crucially, not all!) other domains in biology. The Modern Synthesis is, by and large, what is taught today in undergraduate and graduate textbooks, it represents the Standard Model of the biological sciences. But, just as the Standard Model in physics is known to be incomplete and there has been (pace Sean’s joke) quite a bit of controversy among physicists about how and when it is going to be replaced, so to has the Modern Synthesis been under increasingly severe stress, dating back from the 1960s and ‘70s, but much more intensely so in the ‘90s to the present. Developmental biology was famously left out of the MS, and needed to be brought in. Systematic attempts at doing so have resulted in the development of an entirely new field of research, colloquially known as “evo-devo” , which has been developing its own agenda and principles. Ecology was also only marginal to the MS, and some recently developed ecological principles, such as niche construction theory, need to find an organic place in our way of thinking about evolution . The possibility that selection acts at multiple levels, rather than just on organisms (Darwin) or genes (modern population genetics) has been raised several times. After a couple of false starts under the label of “group selection,” there is now a well developed multi-level theory of selection and its action . Eldredge and Gould’s idea of punctuated equilibria , which maintains that some lineages evolve (geologically) very quickly and then remain unchanged through long periods of stasis. Evolutionary genomics has yielded not only terabytes of new data on the genetic makeup of biological species, but new insights into the evolution of regulatory vs structural (“house keeping”) genes, and has especially highlighted the necessity of thinking in terms of gene networks and their interactions with the environment, rather than single genes with the environment treated as background information . Much research has been devoted to a widespread phenomenon known as phenotypic plasticity, which allows us to model the interaction between genomes and environments in novel ways. Plasticity had been discovered in the early part of the 20th century, but the field has come into its own only in the last couple of decades . A number of authors, chiefly Mary Jane West-Eberhard , have argued that plasticity represents a novel type of evolutionary mechanism, much under appreciated until recently. A trio of interrelated new concepts has been proposed, and has begun to be investigated empirically, to further expand the known set of evolutionary mechanisms: evolvability, robustness, and modularity . There has been increasing evidence that there exist a panoply of epigenetic (i.e., non-genetic) inheritance systems that are responsive to environmental stresses (though definitely not in a Lamarckian fashion! ), that interact with the known genetic inheritance system, and that may play a role at the least in short-term evolutionary responses . A degree of biological complexity can be obtained independently of natural selection. This has been known since D’Arcy Thompson’s classic study on “growth and form” , but has been elaborated theoretically and investigated empirically under the name of “facilitated variation” . This is related to, but further builds on, Gould’s old idea  that so-called developmental constraints can actually play a positive role in evolutionary change. There is increasing evidence — if you ask paleontologists — that macro-evolutionary phenomena (i.e., changes above the species level) are partially causally decoupled from micro-evolutionary ones (i.e., within species) . This has nothing whatsoever to do with the specious arguments proposed by creationists, and everything to do with species selection and group-level properties. I may be missing something, but you get the idea. Now, you could say, as the “no” camp maintains, that all of the above is just cherries on the cake of the Modern Synthesis. I, and a number of others, beg to differ. The above represents a huge set of empirical discoveries and theoretical advances that go well beyond, and are certainly not implied by (and yet do not contradict) the Modern Synthesis. This is stuff that needs to be further explored, better articulated, and explicitly integrated into the general framework of evolutionary theory — work, I might add, that has been well under way for years. The eminently sensible idea behind a push for the recognition of an Extended Synthesis in evolutionary biology, then, is that the above constitutes at the very least the same amount of conceptual novelty in the biological sciences that was represented by the universally acknowledged break between neo-Darwinism and the Modern Synthesis, and certainly much more than the one separating the original Darwinism from the Wallace-Weismann version of the theory. In the end, of course, it doesn’t matter what we call it. Phenotypic plasticity, evolvability, epigenetics, niche construction, facilitated variation and all the rest are here to stay. But, we do usually label different versions of scientific theories with different names, and for good reasons. They mark significant advances in our understanding of the world, and of course recognize the work that went into making those advances, as well as the people who did that work. There certainly is no need for antagonism, on either side of the divide, we can and should all work together to further biological research. But it is hard to see what could possibly justify — given all of the above and much, much more — this recalcitrance to recognize that biology is entering a new phase of its history. It’s a very exciting phase, and one that will, thankfully, soon be in the hands of todays’ graduate students and young researchers. Does evolutionary theory need a rethink?, Nature, 8 October 2014. An Extended Synthesis for Evolutionary Biology, by M. Pigliucci, Annals of the New York Academy of Science 1168:218-228 (2009). / The extended (evolutionary) synthesis debate: where science meets philosophy, by M. Pigliucci and L. Finkelman, BioScience (2014). 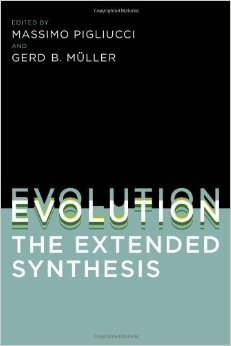 Evolution – the Extended Synthesis, by M. Pigliucci and G.B. Müller, eds. (2010), MIT Press. The Evolution of Evolution: Gradualism, or Punctuated Equilibrium?, by S. Carroll, Preposterous Universe, 10 October 2014. Biological theory: Postmodern evolution?, by John Whitfield, Nature, 3 October 2008. A more in depth treatment of the history of evolutionary theory from a philosophical perspective can be found in: Biology’s last paradigm shift. The transition from natural theology to Darwinism, by M. Pigliucci, Paradigmi 2012 (3):45-58 (2012). It actually began much earlier: for a fascinating discussion of pre-Darwinian concepts of evolution, and how the whole field was actually considered pseudoscientific (! ), see Michael Ruse’s “From pseudoscience to popular science, from popular science to professional science,” in Philosophy of Pseudoscience: Reconsidering the Demarcation Problem, by M. Pigliucci and M. Boudry, eds. (2013), Chicago Press. The Eclipse of Darwinism: Anti-Darwinian Evolution Theories in the Decades around 1900, by P.J. Bowler (1992), Johns Hopkins University Press. Fisher’s fundamental theorem of natural selection, Wiki entry. Evo-devo, by the Understanding Evolution team. Evolution and the Levels of Selection, by S. Okasha (2009), Oxford University Press. Here is an example of what evolutionary genomics labs do. Rather immodestly, I can say that I wrote the book on phenotypic plasticity a few years ago: Phenotypic Plasticity: Beyond Nature and Nurture, by M. Pigliucci (2001), Johns Hopkins University Press. Developmental Plasticity and Evolution, by M.J. West-Eberhard (2003), Oxford University Press. Is evolvability evolvable?, by M. Pigliucci, Nature Reviews Genetics 9:75-82 (2008). / Robustness and Evolvability in Living Systems, by A. Wagner (2007), Princeton University Press. What Role Does Heritable Epigenetic Variation Play in Phenotypic Evolution?, by C. Richards, O. Bossdorf, and M. Pigliucci, BioScience 60 (3):232-237 (2010). / Transgenerational epigenetics, Wiki entry. On Growth and Form, by D.W. Thompson (1945), Cambridge University Press. The theory of facilitated variation, by J. Gerhart and M. Kirschner, Proceedings of the National Academy of Sciences, 104:8582-8589 (2007). Ontogeny and Phylogeny, by S.J. Gould (1985), Belknap Press. See, for instance: Mass extinctions and macroevolution, by D. Jablonski, Paleobiology 3:192-210 (2005). Only owing to comment limits! I agree with your remarks on endosymbiosis and transposons. But the question is whether they add to a gene-centric view, or whether they are incompatible with it. It seems to me that both of those (and epigenetics and phenotypic plasticity and evo-devo and genetic drift and neutral theory, etc) are things that a gene-centrist can assimilate with equanimity. Indeed, there are plenty of writings where gene-centric biologists have done just that (it’s only in strawman versions that they say “… and nothing except this simplified account could be important or interesting”). The gene-centric view sees the gene as the primary replicator, and the phenomena just mentioned only add to the richness of how that plays out. About the only thing on Massimo’s list that a gene-centrist could not assimilate with equanimity is the idea of group-level selection being a major force in evolution, and on that the evidence is lacking. In contrast, the evidence for endosymbiosis, transposons, epigenetics, phenotypic plasticity, etc is incontrovertible. On that point, imzasirf, note that the comment of mine that you replied to was purely about group selection, not the other aspects of the purported ES, which is not an all-or-nothing package. That’s partly why I’m not convinced by the need for a new name. The Modern Synthesis married Darwinian evolution with genetics, but the “extended synthesis” is not one coherent idea, it’s a set of phenomena showing how complicated things can get when the Modern Synthesis gets implemented in the real world. Basically it’s saying that the relationship between phenotype and genotype can get a lot more complicated than in simplified accounts. Ok, fair enough, and in making that sort of comment you are not far from the “no” camp. “There is a lot of interesting stuff in addition …” is very different from some of the rhetoric from the yesies. Right, and that’s why so many people have so ferociously attacked Eldridge and Gould for decades now. The attacks resulted from the fact that there always were two versions of punct-eq, the sensible (and now accepted version) of “How would we expect Darwinism to play out in practice, and on geological timescales?”, and the not so sensible “Darwin was wrong”-hype version, which purported to overturn generational-timescale gradualism. Authorities have found a master thinker, Darwin, and evolution was created. Charles Darwin is the messiah of evolution. Any critique of this miracle is labelled “postmodernist”, rising from a gross lack of non-appurtenance to the church of righteous thinking (prestigious American academia). This attitude comforts religious creationism. Why? It is all too close to the religious mindset. It neglects the evolution of ideas, the giant collaborative reasoning that is science. It reintroduce the concept of the prophet: everybody got it all wrong, before, then comes miracle man, Darwin. Most of the ideas demonstrating that there had been “evolution” were evolved before Darwin. The truth is that Darwin was astounded by the audacity of several of his professors who praised Lamarck for having shown how life had “evolved” from “simple worms”. Buffon introduced the idea that migration caused speciation. He illustrated this with pachyderms. Augier introduced the “Tree of Life”, then much improved by Lamarck. This was much more specific than the general idea that all species came from fishes (Pre-Socratic philosophers). Lamarck spent decades looking at life and fossils through a microscope, and demonstrated that life had evolved over millions of years, by documenting in extreme details the evolution of mollusks. Darwin would later produce a toy model of evolution. Gould told him that some varieties of birds he found in the Galapagos were different species. Yet they all belonged to the finch group. Darwin then brandished that as an example of evolution. Darwin’s “B” notebook showed that he speculated a species could turn into another by summer 1837. He discarded Lamarck’s independent lineages progressing to higher forms, drawing a tree of life with a single trunk branching out (there too Lamarck proved right: decades behind the microscope, remember?). On the continent, evolution was solidly established. Cuvier discovered the “Ptero-Dactyle” (name Latinized later), and Mesosaurus (sea going giant). Cuvier also invented stratigraphy, and demonstrated species came and went. Cuvier was a Christian fundamentalist, but a very clever one, with an open, and changing mind. He invented most of the “Creationist” Biblical arguments. Yet he explained why he could be proven wrong in the fullness of time, thanks to, say, more discoveries. Lamarck’s reputation was soiled because Cuvier smeared it all over with “pangenesis”. The original texts make it clear that Lamarck believed in natural selection. In the case of giraffes, to put it in modern terms, he believed that giraffe ethology, and the vegetation being what it was, due to climate, put a selective pressure favoring giraffe’s anatomy, the way it was. (Cuvier later said it was all about “desire”; that’s not in Lamarck). Darwin tried hard to prove pangenesis. A battle was engaged, still ongoing. Many of the arrogant certainties of the 1960s have been washed away. Elements of heredity are known now to travel among species, and interact with ethology. To combat religious fanatics, we need the weight of evidence, not inappropriate celebritism. Misrepresenting those who discovered evolution only helps creationists. My view (as an amateur observer) is that Darwinism is increasingly irrelevant. True maybe, but not very interesting. The big discoveries of the genomic revolution are not about selection (Darwinism’s strong suit), but about variation, about which the modern synthesis has had little to contribute. The genomic world is nothing like what we were led to expect. Down there the main players are transposons and retroviruses and there’s a lot of stuff don’t yet understand. The Weismann barrier is no longer impermeable. Evolutionary history may be more the result of viral incursions than of incremental adaptation. For samples, look up the work of Luis Villareal (on YouTube), Frank Ryan (Virolution), or my friends K.R. Oliver and Wayne Greene. (you) That is simply incorrect. Darwin’s theory made no claim at all about the mechanism of heredity. Darwin offered a phenological theory of variation with “laws” (in the Origin of Species, there is an entire chapter on “Laws of variation”), and he later offered a “gemmules” mechanism based on physiology. Both were wrong. I confess that, like so many others, I used to read Darwin with blinders on, ignoring the parts he got wrong, because it was written in this odd 19th century language. But his errant views on heredity are apparent in the first paragraph of the first chapter of OOS. As we explain, this is precisely why Johannsen’s experiments were so influential. He showed directly that Darwin’s view could not be correct. It seems clear, given your posts here, that you’re not a ‘neo-Lamarckian,’ you may be truly Lamarckian. You may want to say that the grim materialism of Darwinian theory (and its inheritors) is a negative ideology that has mislead us. Perhaps you want evolution to have proved – or to prove – that nature has a purposiveness and teleology; that evolution has been directed by nature toward improvement of species toward perfection, realized finally in the human species. I’m sorry, but all the evidence stands against this. Nature is mindless, purposeless, and uncaring. Mutations occur randomly; then environment determines which mutations survive and which get destroyed (this destruction is engineered through the inability of individuals to reproduce). The surviving mutations may or may not be clearly adapted to the environment; they may have other uses, they may become vestigial, they may be squelched into disappearance. “If we admit that the geological record is imperfect to an extreme degree, then the facts, which the record does give, strongly support the theory of descent with modification. New species have come on the stage slowly and at successive intervals; and the amount of change after equal intervals of time, is widely different in different groups. The extinction of species and of whole groups of species, which has played so conspicuous a part in the history of the organic world, almost inevitably follows from the principle of natural selection; for old forms are supplanted by new and improved forms. Neither single species nor groups of species reappear when the chain of ordinary generation is once broken. The gradual diffusion of dominant forms, with the slow modification of their descendants, causes the forms of life, after long intervals of time, to appear as if they had changed simultaneously throughout the world.” Darwin. Note the lack of any recourse to ‘ethology’ (animal behavior) here; without the Clean Air Act, over the course of generations, the genetic coding for light-coloring would simply have been squelched; light-colored moths would go extinct; the survivors of this species would all be dark. The ‘pepper moth,’ as a species, would become another species, to which we would need to give a different name. “(Lamarck) believed that giraffe ethology, and the vegetation being what it was, due to climate, put a selective pressure favoring giraffe’s anatomy, the way it was.” Unfortunately, this is just wrong. Mutation occurred, and giraffes grew long necks; long necked giraffes survived, short-necked giraffes died out. You did not address Holdredge’s point, but it is crucial; long-necks make it difficult to drink (and drinking is actually more immediately important to the organism than eating). The survival of long-neck giraffes cannot be reduced to Lamarckian teleological simplicity. I am not a biologist, so claim no special knowledge; but it doesn’t require a biology PhD to recognize that your argument is narrowly focused, poorly informed, and ideologically driven. “To combat religious fanatics” – I’m sorry, that’s not the purpose of science. I’m a non-theist, and, like many contemporary non-theists, I rely on science; but I don’t demand that any science, or scientist, pursue research on the basis of an ideological demand to provide arguments against theistic ideology. The word “science” indicates that such research concerns acquiring knowledge, not weapons for combat. Scientists make mistakes; Darwin made mistakes; Lamarck made fewer mistakes than Cuvier, but more than Darwin. It’s simple as that. The history of science is about cooperation (sometimes hotly debated, but eventually reaching agreement), leading to greater understanding, not combat. As a non-biologist (and really only an essayist, and not a professional anything), I hate to pull the ‘write-for-a-peer-reviewed-journal’ card here, but it seems clear to me that you wish to develop a particular theory of evolution that will get you the progress-toward-perfection teleology you want; in which case, you need to develop that theory clearly, in a manner that accounts for known facts (now many more than either Darwin or Lamarck needed to deal with! ), propose further research, submit your findings to professionals who have spent many years studying evolution, allow them criticism and amendment, correct your theory accordingly. Otherwise, you are engaging in speculation, and attempting to revise history so that it reads favorably to your cause (hence the charges of post-modernism). Again, I’m sorry: Evolution does not develop purposively or progressively. We are not descended from apes, we are simply a certain kind of ape, all the other contemporary apes are on exactly the same step of the ladder that we are, descending from the same fore-bearers we did. Darwin quote: Origin of Species, Chapter XV. As much as I enjoy the clear historical exposition on the developments of evolutionary theories, I am not sure I can follow the arguments. To my best understanding the main argument here seems to be that this situation is comparable (similar, identical?) to another historical situation, so it follows that the same action should be taken again. However, I do not find such reasoning from tradition much compelling. What I find lacking is some kind of principled analysis that provides insights into when a biological theory is actually overturned or outdated. Maybe it was “wrong” (detrimental, imprudent, arbitrary, whatever) to coin the term “modern synthesis” back then and why should we repeat a mistake? Is there any argument to support the idea that “theory labeling” should be done on the basis of conceptual novelty alone (instead of cohesion, explanatory power, etc.). And when is sufficient novelty reached? Why should a decision taken decades ago set a relevant precedent here? I do not see immediately that research on a set of somewhat unrelated – albeit interesting – phenomena that all influence evolutionary processes should be referred to as “a theory” instead of a “set of theories”. Then again neither do I have a detailed picture of what a biological theory entails (or is supposed to accomplish). I think some of these are deep and difficult questions to which philosophy (of biology/science) could contribute a great deal and thereby maybe even help in solving a contemporary (and consequential) controversy in biology. I would be very interested to read a deeper exploration. My view (as an amateur observer) is that Darwinism is increasingly irrelevant. … Evolutionary history may be more the result of viral incursions than of incremental adaptation. Comments like this one are why we should be careful about re-labelling, since by focusing on recent developments one can miss the big picture. The most obvious fact about life is that life-forms are hugely developed and hugely intricate machines of staggering complexity, in which the component sub-systems work together with mind-blowing capability. There is only one way of explaining that: incremental adaptation through Darwinian natural selection acting on the genome. That is the only game in town if one is trying to explain the most obvious and salient aspects of life today. All of the other stuff is peripheral. Things like transposons and retroviruses and epigenetics may be important phenomena in how gene-centred evolution plays out, but only as variations on the basic theme of gene-centric Darwinism, which retains its central importance. To suggest that gene-centric Darwinism is “increasingly irrelevant” or “not very interesting” is preposterous and can only result from focusing on details while missing the big picture. The genome has to remain the centre of this because it is the only information store passed down the generations in the long term. Natural selection has to remain at the centre of this because it is the only mechanism for generating information-rich recipies for complex adapted machines. OK, but variation alone gives you nothing. Variation by itself is the tornado in a scrap-yard (to use the analogy quoted above, from Hoyle’s total misunderstanding of Darwinism). You only get from there to a 747 by Darwinian natural selection. OK, so there are found to be lots of extra ways in which you can get variation, but so what? That’s just different types of tornados. If you look at a cheetah stalking prey and consider it to be akin to the chaotic mess of a scrapyard after a tornado, then fine, put the emphasis on variation. But it blatantly isn’t, the cheetah is a machine far exceeding the crude 747. And the only game in town to explain that is gene-centric Darwinian natural selection. That’s why I find the “no” camp more convincing. That isn’t to deny that most of the developments listed by Massimo are indeed important aspects of how gene-centric Darwinian natural selection plays out in the messy real world. miramaxime, I think you are asking the right kinds of questions. Confusion about what “theory” means is rampant, going beyond the muddle over evolutionary theory. On the wikipedia “theory” page, for instance, the most blatant misconception is that, in science, theories are well justified explanations. Anyone with 15 minutes and an internet connection can verify that real scientists do *not* use the word theory in this way. Scientists who doubt Kimura’s Neutral Theory still call it a theory. The same goes for Lamarck’s theory, the phlogiston theory, the aether theory, etc. A theory (in this sense) is a theory because it is a conjecture about the world, not because it is a true conjecture. But scientists recognize a second meaning of “theory” even when they don’t consciously know it. When we call someone a “theoretician”, we do not mean someone who makes conjectures, but someone who develops formalisms. A good dictionary will often recognize both senses: “grand hypothesis”, and “body of abstract formalisms relevant to some topic”. The wikipedia “theory” page mixes up theoryC (concrete, conjectural) and theoryA (abstract, analytical). Extreme value theory, music theory, population genetics theory, and information theory are bodies of abstractions that no facts can refute. The standard of value for a proposition in theoryA is that it is correctly derived. Once correctly derived, it becomes part of theoryA forever. By contrast, the standard of value for a theoryC is verisimilitude– likeness to the actual world. A theoryC can be killed by facts. I’d like to think that one of my accomplishments as a scientist was to kill Gilbert’s “Exon Theory of Genes” (the theory that genes evolved originally from exons). We can illustrate this with Kimura’s Neutral Theory, the conjecture that most changes at the molecular level are the result of the random fixation of selectively neutral alleles. Ohta proposed a distinct-but-similar-in-flavor “nearly neutral” theory. The mainstream view today is that the Neutral Theory is wrong, but the nearly neutral theory may be right. Population geneticist Marty Kreitman wrote a review entitled “The Neutral Theory is Dead! Long Live the Neutral Theory!”. The title is overtly paradoxical, but it is explained by the 2 meanings of theory: Kreitman is arguing that the neutral theoryC is dead, but the neutral theoryA remains useful for constructing null models. That is, the Neutral TheoryC draws on a body of theoryA about neutral processes. Much of this theoryA existed before the theoryC was proposed, and it remains useful. The main significance of this for the evolution debate is that the writings of the Modern Synthesis contain substantial theoryC content that we no longer accept. The theoryC flesh that animated the MS has rotted away, leaving only a skeleton. Detractors know this and treat the MS a failed theoryC. For defenders, the skeleton of the MS– the parts that survived an onslaught of hostile facts– is the MS. Ambiguity in the word “theory” helps to shield this bait-and-switch from criticism. The last two essays on Biological Evolution, the fruits of decades of meditation, were proximally suggested by an essay from Massimo Pigliucci, a philosopher and biologist (PhD genetics) initially from Italy and now, armed with a PhD in Philosophy (PhDPh?) from the USA, a professor at CUNY. I thought Massimo did the usual Anglosphere trick of attributing the scientific establishment of Biological Evolution to Darwin, not Lamarck. This is fraught with numerous pitfall, not the less of which being that Evolution deniers are thick on the ground in the USA. Indeed reducing the Evolution debate to Darwin and a handful of finches, is all too reductive. To the point of eschewing most of the debate, as I tried to explained in the preceding two essays. Lamarck established the Foundations of Evolution, and demonstrated, first of all, that it happened. Darwin and other made more explicit Evolution through natural selection (which is implicit in Lamarck, who, obviously considered it self-evident from what he described). How these traits are “acquired” is not clear to this day. In recent decades, it became clear that the situation was at least as complicated as Lamarck had described it, and that the so-called “Neo-Darwinist” oversimplification of the 1960s was a grave error (ironically Darwin was on Lamarck’s side!). I will suggest in a further essay of few more paradoxes. Meanwhile, let Massimo describes it as he sees it! My argument? “…giraffe ethology, and the vegetation being what it was, due to climate, put a selective pressure favoring giraffe’s anatomy…” Lamarck said this, Darwin repeated it, pointing out the obvious, by adding an explicit little sentence in his repetition of Lamarck’s giraffe’s observations, namely that lack of food would kill short-necked giraffe (Lamarck politely alluded to it). The fact that long necks were less important than long legs was also implicit in Lamarck. A lot of the details have to do with systems of non-linear differential equations, which have not been. I will not stoop to answer the way you qualify me. Strict “Darwinism” Something To Evolve Out Of? As I have explained, Darwin arrived at the tail end of the establishment of the FACT OF EVOLUTION. Darwin, helped by others, and the pre-existing idea of Evolution, provided a toy example of Evolution: finches in the Galapagos. That was a relatively puny nail in the coffin of theology: millions of years of evolution proven by Lamarck, catastrophism, stratigraphy, flying and swimming reptiles by Cuvier, etc. Lamarck also suggested many ideas through his long and prestigious research career. Most of those considered correct were attributed to others. Other ideas that were correct were misrepresented. A century later, shortly after the (complicated) discovery of genes-as-pieces-of-DNA, a “Modern Synthesis” [of the evolutionary mechanism; NOT of evolution: that was proven by Lamarck], became a religion. What would be the set of mechanisms most appropriate to survival? Teleonomic mechanisms. Inherited mechanisms that would facilitate, and accelerate mutations improving survival. Maybe that’s in part why some species don’t seem to evolve at all (oysters, sharks, non-human hominids, etc.) and others evolve very fast (flowering plants, orchids, humans, etc.). Punctuated equilibrium may not just be a question of unchanging environment. Thus one may suspect that, even if one believe in the strictest blindness of the evolutionary mechanism, that first order evolutionary machinery may have stumbled on eyes. Eyes for evolution. Actually, this is how species evolved eyes (and more than once: cephalopods evolved eyes independently). And now total teleonomy has been achieved: the very product of evolution, man, is not just toying with it, but creating it anew. If man is viewed as evolutionary, clearly the evolution he now creates is a form of meta-evolution with a brain. We have met the creator. Lamarck said it was nature, and now it’s becoming us, a part of nature… with eyes, hands, and lots of imagination. I disagree, and it looks like multi-level selection is an integral part of the evolutionary process, it does not lack evidence. Evolution through natural selection (which is implicit in Lamarck, who, obviously considered it self-evident from what he described). Saying that natural selection is “implicit” in Lamarck’s writings and that he “obviously considered it self-evident” is unconvincing. The quote that you followed that with does not give me that impression. Point taken, and as I came to reply I see you just posted your 5th and last post for the thread. So I’ll say my piece but recognize that it is the last word by default and not because you wouldn’t have anything important to add. I’m not sure why something has to be “incompatible” to be considered novel or different enough that we can recognize that we are not talking about the same model anymore. The level of detail fleshed out already reduces the effectiveness of traditional “gene-centric” concepts. This reads to me like “the phenomena just mentioned (in the standard model) only adds to the richness of how traditional atomic theory plays out”, or “the phenomena just mentioned (in relativity) only adds to the richness of how newtonian physics plays out.” You can use both of the latter systems just fine in certain circumstances and maybe many or most. But an accurate understanding of what is going on is captured by the former theories and the level of added detail creates a graphically new way of looking at things. With epigenetics we are talking about a new class of phenomenon related to heredity of gene expression (parent cell to daughter cell or across generations). It is not clear how you relate that to a “richness” of genes being considered primary replicators. If anything, it suggests that genes as replicators are not always best conceived as the target of selection. And while claiming that gene-centrists could assimilate this, from what people are telling me Dawkins (a rather clear gene-centrist) is having problems accepting epigenetics. It seems contradictory for something to be considered “unorthodox”, fought tooth and nail because of its incongruity with the working model, and when it finally gets accepted as factually true and identified as one of the great achievements in the field, it is said we don’t need to recognize we are now dealing with a new model because the old model could “assimilate it”. The scientists assimilated it, the original model did not. The new information was not incompatible with the original model (at all levels), but the merger (just like prokaryotes becoming a eukaryote) created something new. Your reply treats variation as the rhythm, with selection producing the melody. I’m looking at it the other way round. I follow your metaphors but don’t see the argument. Variation alone gives you nothing but ditto for selection. The genome is not just an information store. Intra-genomic creativity is real, if research of the kind I mentioned is sound. Reblogged this on My Best Horrible History.